1942 1942 (set 1)　Capcom 1984　14,158,180pts　Player Novice　収録Ver Mame32 0.56　エクステンドのスコアを１万点以上飛び越えたらエクステンドが止まります。基礎点が高いときは中型機、低いときは大型機にサイドファイターを当てます。敵５０機ごとに矢七が出るのでガンガンまわします。１００％のボーナスは５万点、ラス２面のボスは５３００点取ったら一回宙返り、弾を撃ちつくして敵弾に突っ込みます。取捨選択してください。※動画はラスト２面のボス稼ぎをカット編集しています。mame replay site http:replayburners.web.fc2.com1942発売年：1984.12 開発／発売元：カプコン ジャンル：シューティング コントローラ：8方向レバー+2ボタン システムボード：専用基板 CPU構成[Z80 (2)]　音源チップ[AY-3-8910 (2)]バルガスに続いて発売された、第二次世界大戦を舞台とした、縦スクロールシューティングゲームが、この「1942」。後に発売される「1943」「1943改」「1941」などの19シリーズのオリジナルである。操作は8方向レバーとショットボタン、さらに緊急回避用の宙返りボタンがある。赤い編隊「赤水」を全滅させると様々なアイテムが出現する。4面構成（最後はボーナス面）が8パターンあり、全部で32面。シンプルな内容が一般層に受け、ロングヒットとなったゲーム。 1942 (c) 1984 Capcom.1942 is a vertically scrolling shoot 'em up set in the Asian theater of World War II. The goal is to reach Tokyo and destroy the entire Japanese air fleet. 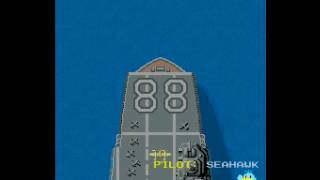 The player (the American 'Super Ace') pilots a plane, and has to shoot down enemy planes. Besides shooting, the player can also perform a 'loop-the-loop' to avoid enemy fire.- TECHNICAL -Main CPU : Z80 (@ 4 Mhz) Sound CPU : Z80 (@ 3 Mhz) Sound Chips : (2x) AY8910 (@ 1.5 Mhz)Players : 2 Control : 8-way joystick Buttons : 2- TRIVIA -Released in December 1984, 1942 was the first game that Okamoto designed at Capcom. 1942 was also the first Capcom title to spawn a successful series of sequels, with 6 titles in the 19XX line released from 1984 to 2000.Stage names : Stages 32-29 : Midway Stages 28-25 : Marshall Stages 24-21 : Attu Stages 20-17 : Rabaul Stages 16-13 : Leyte Stages 12-09 : Saipan Stages 08-05 : Iwojima Stages 04-01 : Okinawa- SCORING -Small planes are 30, 50, 70, 100, 150, or 200 points each.The small red planes that fly formations of 5 or 10 are 100 points each. Shooting all the planes in the 5 plane formation awards 500 bonus points. Shooting all the planes in the 10 plane formation awards 1000 bonus points. In both cases, when the last plane of a formation is destroyed, a powerup marker appears and is worth 1000 points when picked up.Occasionally a small airplane comes slowly out of the lower left or lower right hand side of the screen and flies towards the top. When hit, it turns into a special figure which awards 5000 points when picked up.Medium size planes are 1000 or 1500 points each.Large bomber planes start at 2000 points each. The score for each consecutive bomber destroyed without the player dying is 500 points more than the previous one, up to a maximum of 9000 points. When the player’s ship is destroyed, the score for the bombers is reset back to 2000 points.There are four boss planes. They appear at the end of stages 26, 18, 10, and 02 : The stage 26 boss plane is worth 20000 points. The stage 18 boss plane is worth 30000 points. The stage 10 boss plane is worth 40000 points. The stage 02 boss plane is worth 50000 points.For all enemy planes that require more than one hit to kill, each hit on them gives 100 points.At the end of each stage a bonus is awarded for shooting down percentage and for unused loops : 100% = Special bonus 50000 points (in older revisions, the game displays 10000 points bonus but 50000 points are actually awarded). 95-99% = 20000 points 90-94% = 10000 points 85-89% = 5000 points 80-84% = 4000 points 70-79% = 3000 points 60-69% = 2000 points 50-59% = 1000 points Under 50% = 0 points Unused loops are 1000 points each.Finishing the final stage awards 10000000 points.- SERIES -1. 1942 (1984) 2. 1943 - The Battle of Midway (1987) 3. 1943 Kai - Midway Kaisen (1988) 4. 1941 - Counter Attack [CP-S No. 07] (1990) 5. 19XX - The War Against Destiny [CP-S II No. 13] (1995) 6. 1944 - The Loop Master [CP-S II No. 33] (2000)- STAFF -Designed & programmed by : Yoshiki Okamoto- SOURCES -Game's rom. Game's picture. Hola Amigos De Youtube... Este Es Mi Primer Gameplay... Comenten, Puntuen.. Informacion: Chuzas En Todos Los Niveles... Pero En Algunos (2 - 31) Me Dio La Carita Y No Me Dio Los Pergaminos... Nota: En El Nivel 28 (15:14) Se Me Lagueo El Fraps Y Se Corto La Grabacion Por Unos Segundos.. Disculpen =D Solo Falta La Parte Que Agarraba Los Pergaminos Y Los Sushi xDProgramas Utilizados: Frarp 3.0.3 - Camtasia Studio 8 - Audacity 2.0.3Saludos Y Hasta La Proxima..!! Skip to the second loop at 28:22.Hey there it's time for a new run after a long while. Can you believe it's been SEVEN YEARS since the first time I did this? I wonder if I've improved any. Last stage of 1942, classic '85 Nintendo Entertainment System game. It was quite easy, but the whole game is sometimes difficult. Raiden was manufactured by Seibu Kaihatsu for Arcades and released in 1990 for Arcades. Raiden was ported to many consoles, including the FM Towns Marty, NEC PC Engine, Sega Mega Drive (Raiden Densetsu), Nintendo Super Famicom (Raiden Densetsu), Super NES (Raiden Trad), Atari Jaguar, PlayStation as The Raiden Project, Atari Lynx, Amiga, MS-DOS, and the mobile phone. The MS-DOS port was coded by Nigel 'Freddy' Conroy, Steve Cullen and Martin Randall, and was spearheaded by Martin Hooley. The original Raiden (not the Raiden Project) is available as a download from the Japanese Playstation Network store. The downloadable version can be played on the Playstation 3 console or PSP.Raiden is a classic shmup game, successful so much that later a lot of sequels were made for various consoles and of course, arcades. We control a plane that has 2 main weapons (Spreadshot and straight laser) with 2 subweapons (homingstraight missiles) in 8 different stages. With every stage game gets really hard, and when you lose all lifes, you are returned to a specific checkpoint. That's why this longplay was done with invincibility cheat.The year is 2090. Earth suddenly becomes a target for a race of deranged aliens known as Cranassians. Following the invasion, a new cutting-edge weapon, based on one of the destroyed alien starships, the Raiden Supersonic Attack Fighter, is built to save humanity from the clutches of the crazed aliens.There are 8 stages in the game. When continuing after the player's defeat, they resume from a predefined checkpoint.At the end of each stage, player gains stage bonus equals to the number of medals gained in a stage with current life, multiplied by number of bombs player possesses, multiplied by a 1000. If medal or bomb stock is 0, the count is equal to 1 for each affected field for scoring purposes. After defeating the Stage 8 boss, the mission is completed, and player receives 1 million bonus points. Afterwards, it will start back to Stage 1. This time around, enemies shoot faster and at a more rapid rate. After completing the second 8 stages the player is awarded 2 million bonus points, after completing the third 8 stages, the player is awarded 3 million bonus points, and so on. After the tenth 8 stages, the player is awarded 10 million bonus points. However, for the eleventh 8 stages and later, the amount of bonus points is variable (usually between 7-9 million).The maximum score is 99,999,999. After reaching this score, the player can continue on playing, but the score stays at 99,999,999. After reaching 99,999,999 points, free play is enabled - the credit counter stays at 9 (the maximum number of credits) for all subsequent games until the arcade game is rebooted. This may be a software bug rather than an intentional feature as the sample gameplay sequences prior to starting a game are also disabled after reaching 99,999,999 until the arcade game is rebooted.